An access control software that gives computer users a secure and reliable way to protect their computers from unauthorized access ! 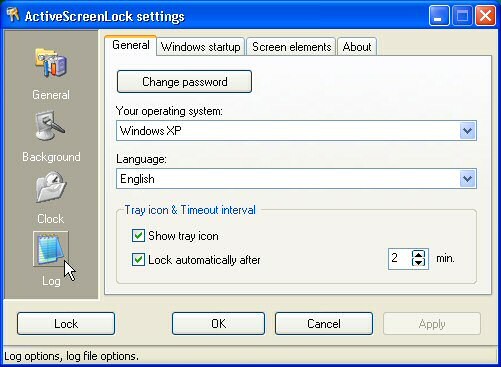 ActiveScreenLock is an access control software that gives computer users a secure and reliable way to protect their computers from unauthorized access. The idea behind this access control software is simple but ingenious – the program simply adds a password-protected window placed on top of all the others. In order to remove it, a correct password needs to be entered. Key combinations Alt+F4, Ctrl+Alt+Del, Alt+Tab, and WinKey are blocked. Keeps a log of all invalid access attempts and wrong passwords entered. The blocking window can be activated by clicking program’s icon or after computer being idle for a set period of time. It has received dozens of awards, including Editor's Choice at top shareware and fileheaven, and 5-star rating at Softpicks, Shareup, FileTransit, SmartDownloads, and UKwares. Also, ActiveScreenLock comes with full install/uninstall support and can be easily mastered by users with any skill levels, since it requires no special knowledge. Blocks your screen with a special window and Password secured. Shows clock while blocking your screen and Supports customized wallpaper. Tray icon feature and Computer can be locked after being idle for a set period of time. Desktop wallpaper can be set as a background with one click and transparent background in Windows XP/2000 and hints in status bar will keep you informed about all options and settings. Automatically runs with windows, if the Reset key has been pressed and Task Manager is fully disabled in Windows 9x/Me/2000/XP. Special optimization for each version of Windows and can be easily translated into any language - all texts are accessible. Password field, clock, program title and mouse cursor can be hidden after some time and All attempts to login and/or use wrong passwords are logged.